Oscar-nominated Ray of Pure Joy and Light Spider-Man: Into the Spider-Verse is one of the best superhero movies of all time. It’s a movie so visually stunning, that we just couldn’t wait to get our hands on its accompanying art book to learn just how one of the most inventive animated features of recent memory came to be—and it’s packed with cool little details about the making of the film. 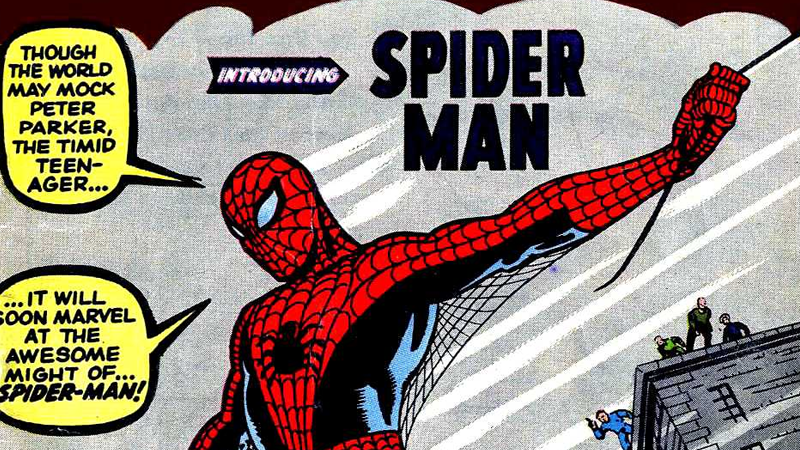 1) The production team had a very cute (but grim) name for Earth-1610's Peter Parker. The practically perfect Spider-Man we and Miles meet early on in Spider-Verse—voiced by Chris Pine, in a major boost to his rankings among the Hollywood Chrises—exists in the movie to...well, die. Given that his limited role is defined by the fact he needs to fall in battle in front of a young, recently powered-up Miles led to the team behind the film giving this version of Spidey a rather grim nickname: RIPeter. Get it? 2) Mahershala Ali’s early casting influenced the design of Uncle Aaron. Most of the characters we see in Into the Spider-Verse have their own unique designs, removed from the appearance of their voice actors—the concept team tried to base most of their character designs off of regular people they saw on the street, to recreate a more grounded everyperson cast of characters. That is, except Miles’ wayward uncle, Aaron, eventually revealed as Kingpin’s hired hitman the Prowler. 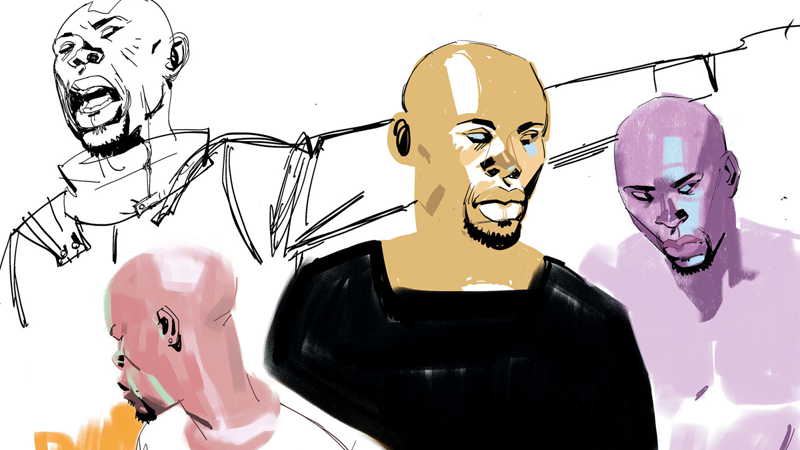 Ali was one of the first actors cast in the early stages of the film’s production, and his facial structure and physique intrigued designer Shiyoon Kim to the point that Aaron ended up borrowing Ali’s tall, svelte shape (offering him an interesting contrast to his bulky sibling, Jefferson). Ali wasn’t the only voice actor who ended up being an inspiration for his character’s design. Early concepts for the film’s version of Aunt May evoked Lily Tomlin—specifically her role in Netflix’s Grace and Frankie—as inspiration before Tomlin was eventually cast in the film. 3) True Life Tales of Spider-Man ended up being made out of hand-inked comic pages. Miles’ spider-powers first manifest in an extended sequence of embarrassment as he finds himself unintentionally stuck to most of his new school’s environment. He eventually attaches himself to a Spider-Man comic book that sees protagonist Billy Barker going through a similar ordeal. Inspired by the classic Steve Ditko art of Spider-Man’s first appearances, the pages for the comic were created by Marcelo Vignali, who had previously worked on Hotel Transylvania and Surf’s Up. To go the extra mile in replicating the aged aesthetic of silver-age comic books, Vignali ended up actually completing several hand-inked comic pages, which were then uploaded digitally and given a fake offset lithography to emulate old-school printing errors. 4) Miles’ best friend Ganke originally had a much bigger role in the film. In the comics, Ganke Lee is practically Miles’ second shadow. As his best friend and confidante in his life as the Ultimate Spider-Man, he’s one of the most important relationships in Miles’ entire social circle...but he’s almost entirely absent from Into the Spider-Verse, outside of finally getting to properly meet his new roommate at the very end of the film. But early on in production, Ganke featured much more prominently in the film and filled a familiar role as an important support figure outside the circle of Spider-heroes for Miles (and even, at first, matched his chubby appearance in the comics, compared to his thinner look in the final film). Several storyboard sequences in the art book depicting the older Peter teaching Miles to swing in the forests of Hudson Valley also feature Ganke gleefully watching as Miles and Peter thwip around—but alas, it was not to be. It’s not mentioned in the art book, but co-producer Philip Lord eventually confirmed on Twitter that the film cut down on Ganke’s involvement in order to avoid having Spider-Verse look like it was copying Jacob Batalon’s Spider-Man: Homecoming character Ned Leeds...who himself is basically Ganke with a different comic book character name. 5) Scorpion originally had a more natural take on his comic book costume. 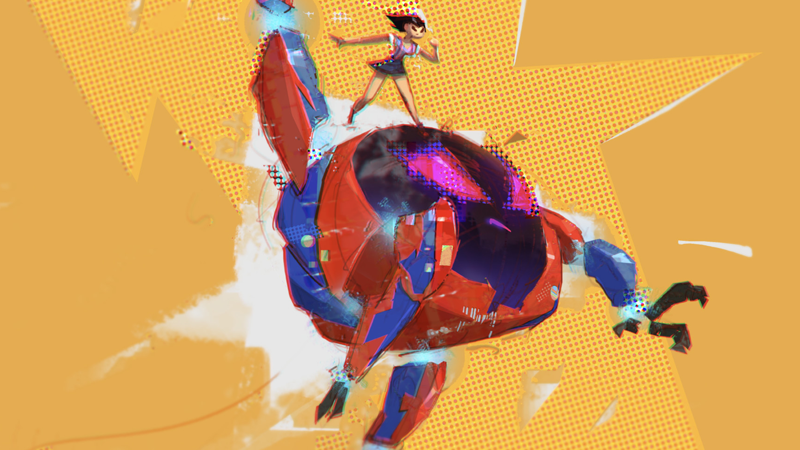 The mechanised, tattooed Scorpion of Into the Spider-Verse is unlike any version of the character we’re typically used to in the comics and other adaptations—but at one point, the mix of grungy tech and the classic neon-green suit of the comics Scorpion originally leaned a bit closer to the comics. Concept art—included in a section of the book on the scrap at Aunt May’s house—features a much more comic-y lizard, with a mechanised tail and a bright green suit, complete with transparent orange goggles. Instead, it was decided to push the familiar aesthetics of the character further than anything audiences had seen before. 6) City scenes are lit warmer or cooler depending on their proximity to Manhattan or Brooklyn. 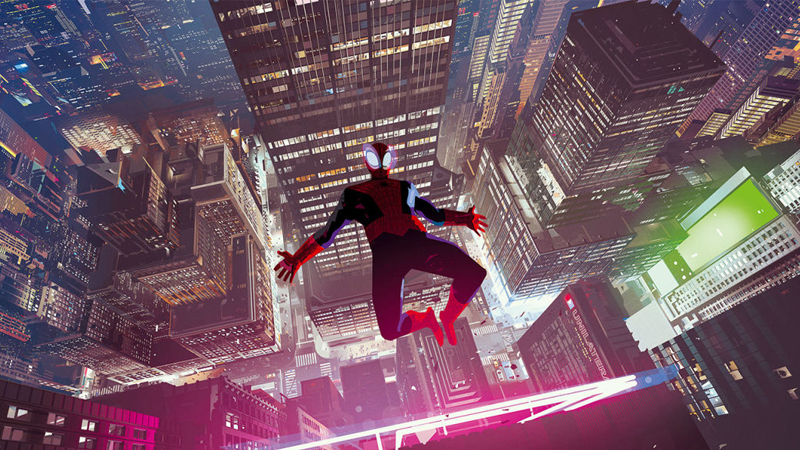 Lighting was a major area where the team behind Spider-Verse wanted the movie to stand out compared to most big blockbuster animated films, incorporating more darkly lit scenes in its cityscape. To differentiate various parts of New York from each other across the film, the colour wheel of the general lighting tone cooled or warmed based around Miles’ character. When in Manhattan, the city is lit cooly to reflect a distance and unfamiliarity. But when action shifts to his home environs in Brooklyn, the colour tone warms up to reflect Miles’ comfort in the area. 7) Peni’s school clothes sparkle thanks to the 30th Century. Aside from the fact that she’s animated to look like she just stepped out of her own anime, one other notable aesthetic flourish to the mecha-piloting Peni Parker is that her school uniform literally shimmers. Given that she’s from a far-future version of New York City, the designers decided to add glimmering effects to her school clothes and other small lit details to reflect the fact that her clothes are actually made out of futuristic materials, and to contrast against the two-toned visual style of the rest of her look. 8) Spider-Man Noir could’ve spoken like an old-timey radio announcer. In a section of the book dedicated to the other Spider-heroes Peter and Miles find convened at RIPeter’s former secret base, one of the cutest notes is a page of little doodles from artist Vi-Dieu Ngyuen, hashing out ideas for Spider-Man Noir’s characterisation. That includes the note that his voice could potentially just sound like he’s a clipped news announcer on a wireless radio, or quote iconic phrases from Depression-era history. Please imagine, and then rejoice, at the idea of Nic Cage trying to do an old-fashioned radio voice.